Dogs just like their human companions face the problem of bone degeneration and arthritis. It is not only common in aging pets but also young pets. Common reasons are excess bodyweight, hereditary reasons, calcium deficiency etc. The four-legged friends show symptoms like limping, lameness in limbs, difficulty in walking, lethargy, unwillingness to play and sore joints. Owners should be mindful of contacting a veterinarian if such symptoms are observed. There could be possibility of canine arthritis if your furry pal shows all these symptoms. Following the advice of the veterinarian and administering dog joint supplements and medications gives quick results in such cases. Some of the most availed canine arthritis treatments are Cosequin for dogs, Flex powder and Joint Guard. Used as non-prescription drugs, these treatments are also revered by veterinarians from across the globe. Diagnosis first: If the pet shows inactivity towards its routine, it suggests he might be feeling pain or discomfort in the joints. Take him to a veterinarian and get to know the exact reason before starting any therapy or treatment. Complete treatment: Give all the vet suggested medications and dog joint supplements as soon as you detect the pet has this awful joint degenerative disease. Along with this, pet owners need to make some changes in the pet’s life style to get the best results out of the treatment. Watch on the dog’s weight: Excess weight can be an additional problem for pets facing joint issues. Make sure you keep your pet slim. If he has chances of getting this disorder through genetics then make sure you make him exercise well and maintain his weight since a young age. Weight management is the best way to combat this canine joint problem. Joint supplements: Adding joint supplements in your dog’s diet will provide additional nutrition required for healthy bone functioning, cartilage development and repair of damaged joint tissues. Available in capsules, powder and chewable forms, dog joint supplements fill up the gap of a balanced diet in dogs. Cosequin for dogs, Joint Formula and Glucosamine Aristopet are some of the most popular canine joint supplements. Exercise and controlled movement: It becomes very important to get the arthritic pet do some exercise. 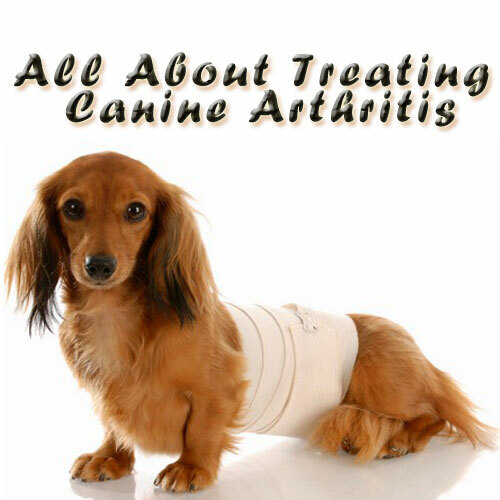 It is done to prevent rigidity and stiffness in the pet’s joint muscles. If the pet is aging then go for light exercises like walking, underwater treadmill, swimming and simple stretching. Heavy exercises are an absolute no for arthritic canines. Natural and alternative therapies: Apart from natural nutritional supplements, alternative therapies like acupuncture and messages are of great help in relieving joint pain in canines. Consult your veterinarian about the need of any of these. Follow his advice and then only get your pet go through these alternative medications and therapies. Surgical treatments: In worst cases, pet parents need to opt for surgical methods of treating arthritis in dogs. It is painful for the pet and demands lot of patience from the pet owners. Hip replacement, femoral head removal and arthrodesis are common surgeries conducted for canine arthritis. In case of congenital problems, reconstructive surgeries help a great deal. Using more than one treatment helps in treating arthritis in dogs. However, that needs to be strictly done under the guidance of a veterinarian. To sum up, just be more watchful of your pet’s behavior, give them the joint supplements regularly and get them treated for joint disorders and arthritic conditions at the earliest.